This one-day course covers advanced Scrum and Agile techniques for experienced Scrum Masters and Agile coaches. 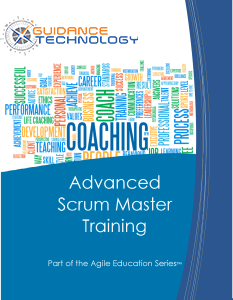 This course assumes you have taken traditional Scrum Master training and want to develop your Agile coaching skills. How Agile are you? – An online organizational assessment performed prior to class helps define where you are and where you are going in Agile Maturity. What is a coach? – Scrum Masters need the skills to resolve conflict and coach team members. One-on-one exercises help the participant model effective coaching. What else can I implement to be more Agile? – Advanced requirement techniques, Agile reporting, and additional Agile practices are all covered in this course to ensure you have a thorough understanding of the Agile tools and techniques available to your organization.